Saudi Arabia is poised to drive Middle-East Elevators and Escalators Market. With growth in construction market owing to various up-coming public & private infrastructure projects, the market for elevators and escalators is expected to witness significant growth over the next six years. Also, surging demand and increasing competition is resulting into decline in prices of elevators and escalators in Saudi Arabian market. Moreover, growing domestic manufacturing and joint ventures of international players with domestic players have additionally slashed the prices of elevators and escalators in the country. According to 6Wresearch, Saudi Arabia Elevators and Escalators market is projected to grow at a CAGR of 7.2% during 2015-21. In Saudi Arabia Elevators and Escalators market, Elevators have prominently fueled the growth of the overall market, however in the forecast period; elevators market would marginally lose its market share to the escalators. Amongst all the applications, commercial application has captured major share of market pie in overall elevators and escalators market in Saudi Arabia. Expanding retail sector, construction of new hotels, hospitals, metros, and commercial offices/ business parks are spurring elevators and escalators demand in the country. Retail segment accounted for key share in the commercial application. In Saudi Arabia elevators & escalator market, western region leads the market followed by the central region. Western region is one of the key regions for construction market and has witnessed high degree of urbanization over last few years. The construction of high rise buildings in the region has fueled the demand for the elevators and escalators. The key cities in the region are Meccah, Riyadh, Jeddah and Madinah are playing vital role for the growth of the market. “Saudi Arabia Elevators and Escalators Market (2015–2021)” provides in-depth analysis with 105 figures and 21 tables. 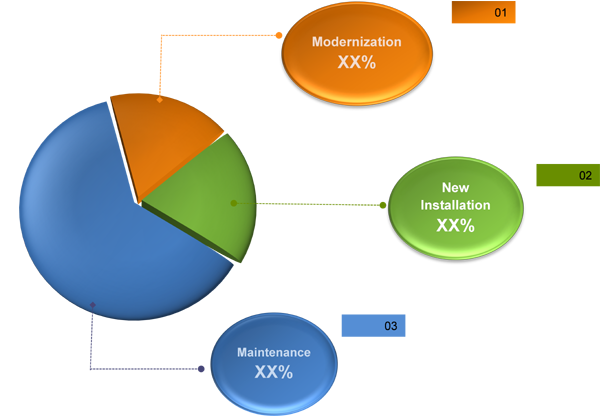 The report estimates and forecast overall Saudi Arabia elevators and escalators market by revenue, by elevators types such as Geared and Gear Less with Machine Room Elevators, Hydraulic elevators, and Machine Room Less elevators, by escalators types such as Moving Stairs escalators and Moving Walkways escalators, by services such as new installation, modernization and maintenance, by application such as residential, commercial and industrial and elevators and escalators market by regions such as Southern region, Eastern region, Western region and Central region. The report also gives the insights on competitive landscape, market share by companies, price trends, company profiles, market drivers and restraints.